Which production scheduling approach is the best for your manufacturing business? Whether one tries to manage a large production company, a small job shop or simply one’s own working day, having a plan is of utmost importance. In fact, whenever different activities have to be allocated to certain resources under several constraints, a schedule is a necessity. Certainly, there is not the one scheduling approach that outperforms any other under all circumstances; A simple calendar might be suitable for a student trying to schedule his day, a small manufacturer might use improvised scheduling tools like Microsoft Excel or a whiteboard, whereas large production firms make use of scheduling algorithms that can optimize complex production plans. In short, scheduling challenges have a broad variety that can be handled efficiently in different ways: from simple analogue timetables to heavy software packages. This post provides guidance in terms of which scheduling approach is suitable for which kind of manufacturer. Basically there are four categories of scheduling approaches which might be suitable for manufacturing firms: Manual Scheduling, Excel, Automatic Scheduling and Advanced Planning and Scheduling (APS). Let’s briefly look at each category in turn. With the usage of a Manual Scheduling Board, different jobs have the same priority and might be competing for the same resources. A manual scheduling board provides a graphical overview of the allocation of different jobs to the available resources. The planner can move an order or the tasks of an order manually, which might impact other orders. However, when making any changes to the scheduling board, other orders are not automatically adjusted. Thus, it is the planner’s task to solve conflicts and adjust the schedule via drag & drop actions. Microsoft Excel is used for all kinds of purposes, which are rather untypical for the spreadsheet application. Numerous (usually small) manufacturing companies use Excel as an improvised scheduling tool by manually allocating jobs to resources. In this manner, a “handmade” Excel schedule is created by the planner. With the usage of a scheduling board with Automatic Scheduling, a priority number is assigned to an individual order. The schedule automatically allocates new orders to available resources while taking the priority status into account. It is the scheduling engine’s task to solve conflicts. The planner can trigger an adjustment of the schedule by changing a job’s priority or add extra capacity/resources. Finally, some manufacturing firms opt for an APS software. Complex algorithms are used to solve optimization problems subject to several constraints. Thus, optimal or near-optimal schedules are generated and aid the decision making of manufacturers. Clearly, APS systems are far more complex and sophisticated than all other previously mentioned scheduling options. Certainly, knowing about the landscape of different scheduling approaches is not sufficient. One also has to understand the characteristics and features of one’s production processes in order to correctly identify the most fitting scheduling approach. A simple but sufficient method is to position a manufacturing firm along two dimensions – Complexity and Volatility. Complexity rises as the number of orders increases and as the tasks making up an order grow or become more intertwined. A manufacturing process with a high complexity has many different orders that are made up of numerous tasks. These tasks have a complex routing with many inter-dependencies and require different resources. With a growing business, the job orders usually become more complex; more resources are available, and more jobs have to be processed at the same time. The volatility measures how much the job data changes in a short amount of time. In a highly volatile environment – like in job shops or high mix low volume businesses – it is common that new production orders come in frequently and have to be processed in a timely manner. Furthermore, with a high volatility, existing jobs and tasks have to be adjusted (e.g. due to prolonged operation times) or cancelled quickly. Thus, the scheduling approach has to be agile and flexible due to ongoing changes with scheduling impacts. If a manufacturing process is characterized by a rather small amount of simple jobs (low complexity) as well as stable conditions (low volatility), an improvised Excel-sheet can be the right tool. If the quantity of production orders is low, Excel provides a nice overview of the planning data for the planner. As the volatility of the planning data is low, job that are manually added once, rarely have to be adjusted. If a new order comes in, the planner can include it with no or little changes to existing job orders. This method can quickly reach its limits as the business grows. More and more job come in and become increasingly interdependent and volatile. The planner will then not be able to cope with the planning data by using excel only. 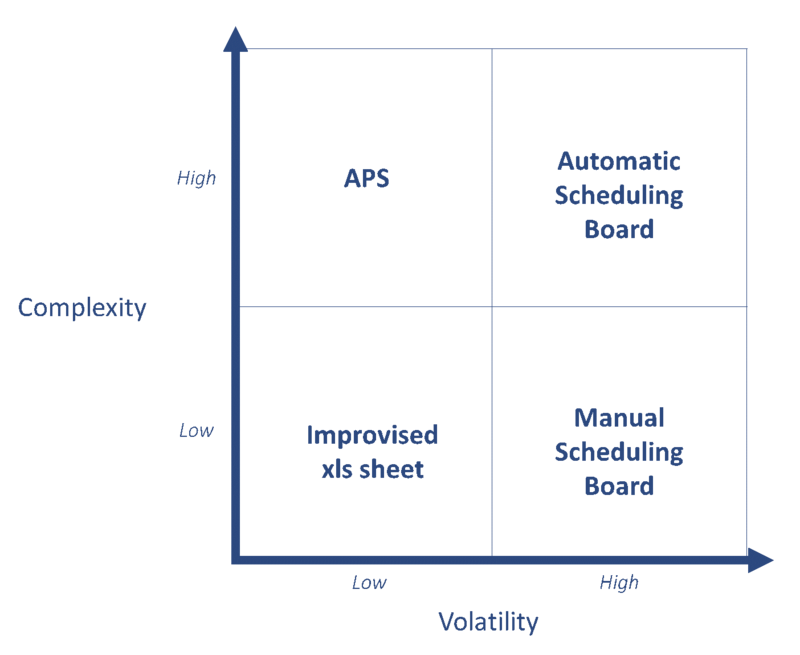 With simple and little jobs in place (low complexity), which are, however, exposed to frequent changes (high degree of volatility), a manual scheduling board can be useful. In comparison to xls the routing dependencies of the production orders are automatically considered when changing the schedule. If a new job order comes in, the planner has to incorporate it into the existing plan. Thus, he has full authority in solving conflicts that might arise if several jobs compete for the same resources. As the plan can be easily altered, it is suitable for volatile environments. However, this only holds under the condition of low complexity; Otherwise, it will get – at least – time consuming for the planner to efficiently manage all the conflicts manually. As both, complexity and volatility rise, planners should better rely on automatic scheduling boards. With more jobs subject to complicated task routings (high complexity) and more frequent changes to the schedule (high volatility), it becomes virtually impossible to solve resource conflicts manually, especially when one has to respond to changing circumstances quickly. Thus, a scheduling algorithm that is triggered whenever the planner adds a new order, makes changes to the priority order or includes new resources, can provide help in dealing with the complexity. Additionally, the planner can add time or resource constraints that are taken into account by the scheduling engine. Simply put, automatic scheduling assists the planner by creating an effective plan with all the input data provided. Once the planner understands and masters the automated scheduling tool, it can be a great assistance in managing the great amount of planning data. Lastly, a planner could also make use of an APS system to deal with highly complex input data. However, investing time, money and effort into complicated algorithms that optimize a production plan is only beneficial if the planner does not have to change it several times a day and if the quality of planning data is reliably high. Then APS will be a valid choice. If not then the quite high running costs won´t pay off. Take the example of a job shop: If a job shop manufacturer has to slightly change the routing of an existing job order, he does not have the time to wait for an entirely new “optimized solution”. One can say that the complexity of the APS system itself conflicts with the high volatility of the job shop. Therefore, an APS system only pays off if a manufacturing process is expected to remain stable for a certain amount of time. It goes without saying that other factors besides complexity and volatility might become relevant in deciding which scheduling approach to implement. Some planners might need to invest a lot of time in understanding automatic scheduling software, others might be familiar with the functions right away. Some manufacturers are willing to invest heavily in assisting scheduling tools, others refuse to do so. Many other factors play a role. It is also not uncommon to start with a manual tool before switching to automated scheduling tools as a business grows and becomes more complicated. The suggested dimensions – complexity and volatility – should serve as a guidance in where to locate one’s own business. They help to understand one’s own production processes in more detail which is essential in making decisions about the most effective scheduling approaches followed to best manage those production processes. With just plan it, we offer both manual scheduling and automatic scheduling. Check it out. The trial is for free.